It all started with Maenam for Chef Angus An. His upscale Thai eatery has put him on the map in Vancouver. Say what you want about the place, but he has his fans and hence, has expanded his restaurant empire steadily. 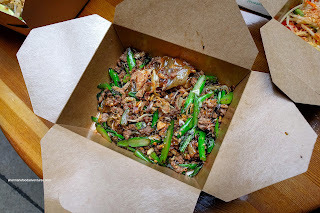 There was Longtail Kitchen, then Fat Mao Noodles, followed by Free Bird. Now we find Sen Pad Thai located in a food stall on Granville Island. As the name suggests, one will find different versions of pad thai and other stir-fried Thai favourites. Grace and I ventured out to the land of tourists on a fine Summer day to try the place out. 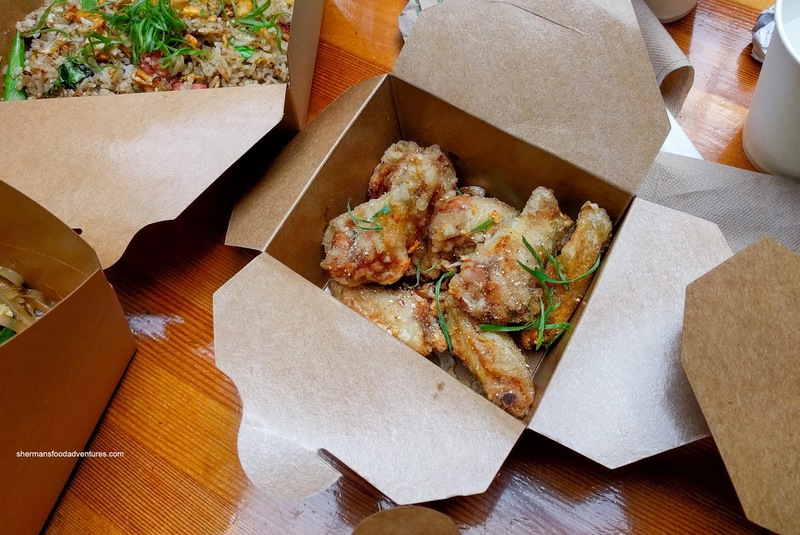 We started with the Fried Chicken Wings with Thai garlic. This is the same one found at Longtail Kitchen, but unlike the ones I had there, these were completely underseasoned. They were crispy though with well-rendered skin. However, the accompanying dip is what makes the dish and that it did with a sweet, tangy and spicy fish sauce. It was super impactful and in fact, made me forget the wings were not flavourful on their own. 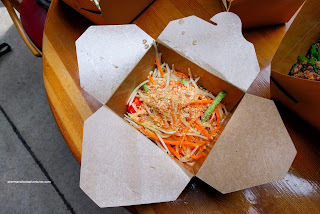 Next, we had the Papaya Salad which featured fresh and crunchy julienned green papaya and carrot. It was bathed in a tart and spicy dressing that was a bit muted for my tastes. The flavours were bright though, but I would've liked to see a bit more sweetness for balance. 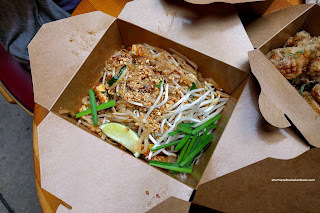 Of course we got an order of the Pad Thai, but specifically the Pad Thai Goong (with shrimp). Although the dish looked rather pale and lifeless, nothing could be further from that. The chewy noodles were not oversauced and were the beneficiary of enough wok heat. The caramelized flavours were deeply sweet and super tangy (from the tamarind) with impactful spiciness. One could add more with the available chilis at the counter. There was enough pickled turnip to add both a crunch and more salty tang. I found the Pad See Ew even more smoky and caramelized from the wok fry, possibly due to the soy and palm sugar. The mung bean noodles were chewy and delicious (absorbed all the flavours), but there wasn't enough of it. We appreciated the abundance of ground pork, but there was too much of it. Adding some Prik Nahm Som (chili vinegar) kicked up the flavours even more so. 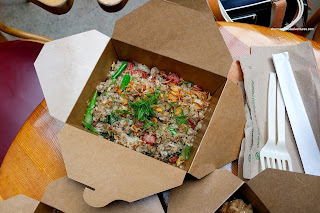 Lastly, we had the Khao Pad with a wealth of tangy sausage. It was a nice pop of flavour to contrast the pungent fried rice which had the aroma of caramelized fish sauce. There was a smokiness from the hot wok and also a noticeable spice level. The rice itself was chewy while the sausage had a nice meatiness that wasn't overly heavy. Overall, we both enjoyed the food offered at Sen Pad Thai as they were prepared with plenty of wok heat and enough spice. Prices are a little on the higher side, but not unreasonable. 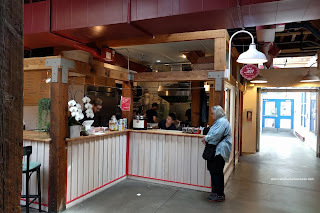 It's nice to see something a bit different with real punch of flavours on Granville Island.